Image © [caption id="" align="alignnone" width="566"] ©anevillemorgan[/caption] Over the last few days, Syrian ambassador Nawaf Fares has defected from President Bashar Assad’s government and urged other senior Syrian politicians to follow suit. From Syrian diplomats and army members announcing their desertion, the humiliation of political prisoners, to a mother’s plea for international help, our screens have continually been flooded with videos displaying the escalating violence in Syria since the beginning of the Arab Spring. The Arab Spring was sparked by the self-immolation of the Tunisian graduate Mohamed Bouazizi on December 17th 2010. Tunisian police arrested Bouazizi as he unlawfully sold groceries to provide for his family in an area of significant unemployment. The poignancy of his act in protest to the unemployment - and crucially the corruption of the police - has altered the shape of the Arab World ever since. International spectators watched awestruck as Hosni Mubarak resigned from office on February 11th 2011, and then - eight months later - witnessed the death of Muammar Gaddafi. Two political impossibles became reality. However unlike Mubarak and more like Gaddafi, the political unrest of Syria’s revolution has been met with the brutal strength of the political regime; with Assad still refusing to step down despite increasing international pressure. Before the introduction of modern technology and new media, Arabs ruled by corrupt governments found no method through which they could effectively demand change; instead “the poor, the working classes and the middle classes met only callous indifference, corruption, and humiliation when they sought redress from their governments.” (Kenneth M Pollack; ‘Introduction: Understanding the Arab Awakening’, 2011, p3). Within sites of conflict, YouTube has recently become a powerful instrument for the circulation and communication of videos. In Syria, new camera technologies, especially those integrated into mobile phones, have the “potential to be a tool, a weapon, and a witness in the hands of ordinary people” (Deidre Boyle; Subject to Change: Guerrilla Television Revisited, 1997, p206). Citizens can now freely join together in displaying and broadcasting their struggle through the online public sphere and simultaneously “manage their distance from political issues” (Philip Howard; ‘New Media Campaigns and the Managed Citizen, 2006, p186). Those however, who initiate uprisings, or are found to have been uploading particularly revealing material concerning the regime, have met severe consequences. Khaled Said was beaten to death by police officers in Alexandria, Egypt, in June 2010 after uploading a scene of police corruption. However his death was not in vain as new media technology prevailed. Said’s death sparked the Facebook group ‘We are all Khaled Said’ set up by Internet activist and computer engineer Wael Ghonim. Unfortunately viral activism has not always remained an effortless task, best displayed in an interview for Lebanese news site nowlebanon.com, Blogger Angie Nassar spoke to Shakeeb al-Jabri(@LeShaque on Twitter) about his work as a Syrian blogger and activist. “From the beginning, I decided that I have two choices; either bump up my profile or hide. I have some prominence as an outspoken blogger.” Modern technology has revolutionised the way information is shared and has enabled a global audience to become active witnesses to the Arab Spring. 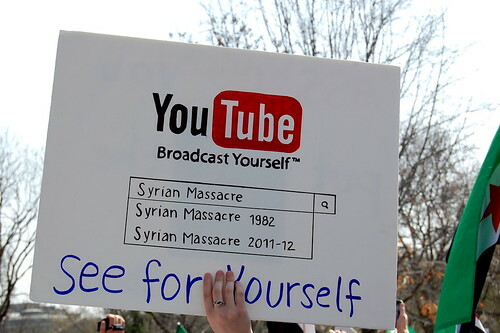 Despite the Syrian government’s denial of crimes against humanity, and their attempt to shift the responsibility of the mass killings on ‘armed gangs’, YouTube has served as Arab civilians’ communicative tool to exterior international viewers; their plea for help. Video has allowed witnesses to validate their claims of terror into visible evidence, and ultimately transform the rising estimate of killings into detailed accounts of horror. However, perpetrators of torture and mass killings have also demonstrated their own motivational uses for video in inflicting fear and exposing the humiliation of their subjects. Without Internet and video sharing sites such as YouTube, how little would the international eye see? Only by comparing previous global ignorance of massacres, with the situation today, can we truly answer this question. One such example is the Hama Massacre which occurred in Syria over thirty years ago. Here the nationalist and socialist politics of the Ba’ath party clashed with the more conservative Muslim Brotherhood; resulted in the membership of the Brotherhood becoming “a capital offence” (Patrick Seale; Asad of Syria: The Struggle for the Middle East, 1988, p329). The Hama Massacre resulted as was the regime’s systematic attempt to remove as many members of the Brotherhood as possible. At the time, the Ba’ath party’s control over the media resulted in the ambiguous documentation the events: “The exact number of killed persons is not known until today and, as much of the reports about Hama, object to political bias. This is also a result of the fact that during the incident journalists were not allowed to enter the city and most of the reports are based on testimonies of eyewitnesses or diplomats, both of them mainly biased.” (Kathrin Wiedl; ‘The Hama Massacre: reasons, supporters of the rebellion, consequences’, 2006, p9). Much of the events, which occurred under the ruling of Ba’ath party, are absent within official records and historical documentation. “At the time of the massacre, the Syrian regime of President Hafez Al-Assad had hermetically sealed off the entire city to the outside world, as heavy artillery and aerial bombing pounded away at positions held by his bitter opponents – The Muslim Brotherhood.” (Yitschak Ben Gad; Politics, Lies and Videotape, 1991, p368) According to Amnesty International the deaths on both sides were recorded as between 10,000 and 20,000 and according to the Washington Post 20,000 children were orphaned, whereas the incumbent Syrian governor claimed 1,200 was the sum for both sides of the conflict. At the time, witness accounts told how “scores of males over the age of fourteen were rounded up almost at random and shot” (Patrick Seale; Asad of Syria: The Struggle for the Middle East, 1988, p329) with the government claiming that online news outlets had “published wild and unsubstantiated rumours.” (Yitschak Ben Gad; Politics, Lies and Videotape, 1991, p368) The function of video as a resistance tool against a regime may seem effective yet, even as these videos are uploaded, and even whilst they serve as a great display of evidence against the authorities, the Syrian people must still fight the regime’s denial of events. Videos uploaded onto the Internet for global viewers has formed a resistance to the ‘writing’ of history as an elitist activity. Syrian suffering is documented through new media and the Internet functions as a spotlight upon that which, until recently, would have been forgotten. As violence takes place in Syria, international viewers can watch these events on live streaming websites or on YouTube shortly after the incident has occurred. This has integrated foreign conflict into current news across the globe and often those watching television or surfing the Internet world wide learn of Syria’s suffering before others in Syria who have no access to the Internet. Perhaps new media will integrate distant horror into our everyday lives desensitising our viewing of it on the other hand, perhaps international viewing will increase pressure on leaders and allow for governments to be made accountable for their actions. New media and technology has provided civilians with a means by which they can identify others who share their struggle, establishing a support system for those who are repressed and strengthening the opposition. Over the last few days, Syrian ambassador Nawaf Fares has defected from President Bashar Assad’s government and urged other senior Syrian politicians to follow suit. From Syrian diplomats and army members announcing their desertion, the humiliation of political prisoners, to a mother’s plea for international help, our screens have continually been flooded with videos displaying the escalating violence in Syria since the beginning of the Arab Spring. The Arab Spring was sparked by the self-immolation of the Tunisian graduate Mohamed Bouazizi on December 17th 2010. Tunisian police arrested Bouazizi as he unlawfully sold groceries to provide for his family in an area of significant unemployment. The poignancy of his act in protest to the unemployment – and crucially the corruption of the police – has altered the shape of the Arab World ever since. International spectators watched awestruck as Hosni Mubarak resigned from office on February 11th 2011, and then – eight months later – witnessed the death of Muammar Gaddafi. Two political impossibles became reality. However unlike Mubarak and more like Gaddafi, the political unrest of Syria’s revolution has been met with the brutal strength of the political regime; with Assad still refusing to step down despite increasing international pressure. Before the introduction of modern technology and new media, Arabs ruled by corrupt governments found no method through which they could effectively demand change; instead “the poor, the working classes and the middle classes met only callous indifference, corruption, and humiliation when they sought redress from their governments.” (Kenneth M Pollack; ‘Introduction: Understanding the Arab Awakening’, 2011, p3). Within sites of conflict, YouTube has recently become a powerful instrument for the circulation and communication of videos. In Syria, new camera technologies, especially those integrated into mobile phones, have the “potential to be a tool, a weapon, and a witness in the hands of ordinary people” (Deidre Boyle; Subject to Change: Guerrilla Television Revisited, 1997, p206). Citizens can now freely join together in displaying and broadcasting their struggle through the online public sphere and simultaneously “manage their distance from political issues” (Philip Howard; ‘New Media Campaigns and the Managed Citizen, 2006, p186). Those however, who initiate uprisings, or are found to have been uploading particularly revealing material concerning the regime, have met severe consequences. Modern technology has revolutionised the way information is shared and has enabled a global audience to become active witnesses to the Arab Spring. Despite the Syrian government’s denial of crimes against humanity, and their attempt to shift the responsibility of the mass killings on ‘armed gangs’, YouTube has served as Arab civilians’ communicative tool to exterior international viewers; their plea for help. Video has allowed witnesses to validate their claims of terror into visible evidence, and ultimately transform the rising estimate of killings into detailed accounts of horror. However, perpetrators of torture and mass killings have also demonstrated their own motivational uses for video in inflicting fear and exposing the humiliation of their subjects. Without Internet and video sharing sites such as YouTube, how little would the international eye see? Only by comparing previous global ignorance of massacres, with the situation today, can we truly answer this question. The function of video as a resistance tool against a regime may seem effective yet, even as these videos are uploaded, and even whilst they serve as a great display of evidence against the authorities, the Syrian people must still fight the regime’s denial of events. Videos uploaded onto the Internet for global viewers has formed a resistance to the ‘writing’ of history as an elitist activity. Syrian suffering is documented through new media and the Internet functions as a spotlight upon that which, until recently, would have been forgotten. As violence takes place in Syria, international viewers can watch these events on live streaming websites or on YouTube shortly after the incident has occurred. This has integrated foreign conflict into current news across the globe and often those watching television or surfing the Internet world wide learn of Syria’s suffering before others in Syria who have no access to the Internet. Perhaps new media will integrate distant horror into our everyday lives desensitising our viewing of it on the other hand, perhaps international viewing will increase pressure on leaders and allow for governments to be made accountable for their actions. New media and technology has provided civilians with a means by which they can identify others who share their struggle, establishing a support system for those who are repressed and strengthening the opposition.